Every day before the sun sets a kerfuffle ensues in our hen house. Rose, our Buff Orpington, dazed and confused as always, runs around in circles. Surly Sofia, our Rhode Island Red, squawks her heart out. The wild rumpus rolls while feathers fly until the two eventually acquiesce to bedtime. Sofia settles on the highest roost while Rose ends up at the opposite corner, at the farthest end, as far away from Sofia as possible. The two have this one-of-a-kind love-hate relationship. They may have their small, petty fights at bedtime every night but they happily dust-bathe side by side in the sun every day. Despite their nightly squabbles, they get along. They have to get along! They have no other choice but to get along! They are what remain of our motley flock after Blanche, our Silver Laced Wyandotte, passed away in September and after we lost Dorothy, our tall Rhode Island Red, in December. We lost Dorothy to a hawk. Yes, a hawk! A red-tailed hawk, in fact. The chickens were out and about in the kitchen garden by themselves when it happened. In the middle of the quiet afternoon, Dennis heard a commotion. He stepped outside and found Rose and Sofia clucking in terror behind the compost pile. At the other end of the garden, he saw the hawk take off, leaving Dorothy lifeless on the ground. We didn’t think it would happen but it did. It was heartbreaking. We’ve raised these chickens since they were chicks and we’ve watched them grow. It breaks our hearts to lose them this way. But life moves on. Shortly after we lost Dorothy, Rose and Sofia moved in to their new hen house we had someone build for us. It sits in the kitchen garden flanked by our raised beds on one side and our asparagus patch on the other. The house is made of recycled redwood and is predator-proof. We don’t let the chickens out to graze unsupervised for now until we figure out a safe way for them to enjoy the garden by themselves. In a few weeks, our new baby chicks will arrive in the mail, the same way Blanche, Dorothy, Sofia, and Rose did two years ago. Yes, we are getting reinforcements to our flock. We need to keep those eggs rolling. When Blanche fell terribly ill we were so heartbroken. We thought she would outlive Rose and the two Reds. Blanche was the friendliest among the four, always the first one to greet us whenever we visit the hen house. She was also the bravest and the smartest, always ahead of the others in finding worms and slugs. So when she passed away so unexpectedly we were convinced she took her fate into her hands. We have been making plans to slaughter the chickens for a roast once they retire from laying eggs. We were convinced she didn’t want to end up in a stew pot. We were convinced Blanche wanted a more dramatic ending. In honor of Blanche and Dorothy, whom we miss very dearly, we roasted a chicken. No, it wasn’t Sofia nor Rose. Not yet, I suppose. We brined then roasted the chicken with calamansi and tanglad — lemongrass, grown in our kitchen garden. This simple roast, in my book, is the best way of roasting chicken, the best way of honoring our departed friends. Combine all ingredients for calamansi brine in a large pot, cover, and bring to a boil. Let it boil for a minute, stirring to dissolve the salt. Remove from the heat and cool completely, then chill before using. The brine can be refrigerated for up to 3 days. Pour brine into a container large enough to hold the chicken like a soup pot. Add chicken and refrigerate for 12 hours to a day. Remove chicken from brine, rinse with cold water, pat dry with paper towels and let it rest at room temperature for over an hour. Preheat oven to 425 degrees F. Rub chicken with olive oil, then season generously inside and out with salt and pepper. 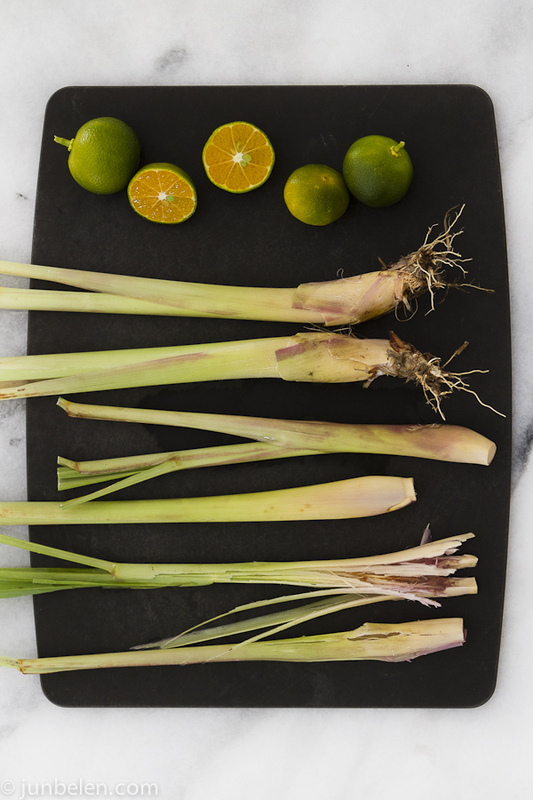 Trim the bottom and the very top of the lemongrass stalks then peel off the outermost layers. With a pestle or the bottom of a heavy bowl or mug smash the stalks gently until they are bruised. Stuff the chicken with calamansi, lemongrass and garlic. 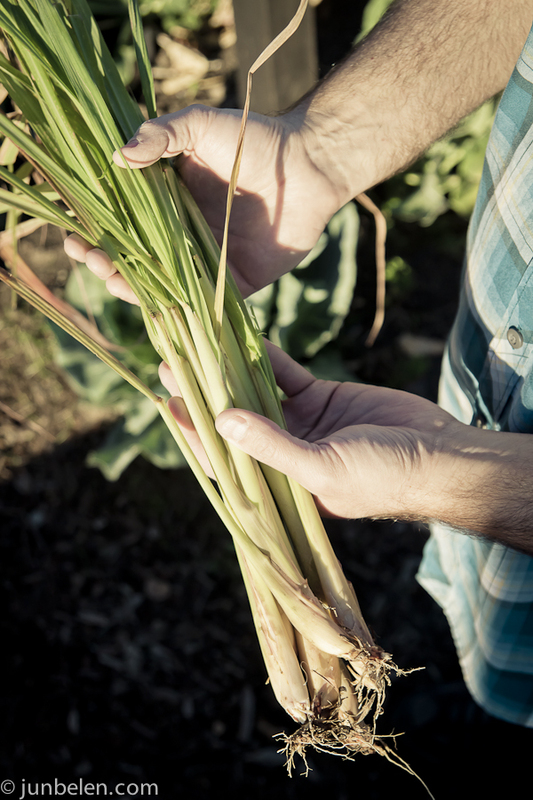 If lemongrass stalks are too long fold them once or tie them into a knot before stuffing them into the chicken. Tie chicken legs together with kitchen twine and tuck the wing tips under its body. Place chicken breast side up on a roasting rack in a pan. Roast at 425 degrees F for ten minutes. Reduce oven temperature to 350 degrees F and continue roasting until juices run clear when chicken is pierced and skin turns brown. 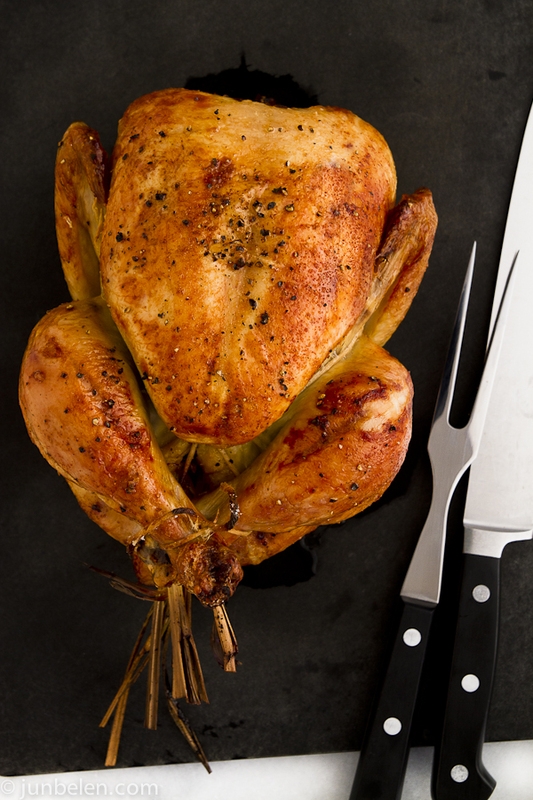 Chicken is cooked when the breast temperature reads 180 degrees F.
Let chicken rest about 15 to 20 minutes before carving. Interesting to read about your hen avocation. Are they noisy? How much time to you need for them? Sounds like if half of them are dying to uncertain causes, its a questionable pursuit at times–not that I would dissuade you from continuing it. When we return to the Philippines, we hope to have a small chicken population at my wfei’s cousin’s country home outside of Bacolod, along with a substantial garden. 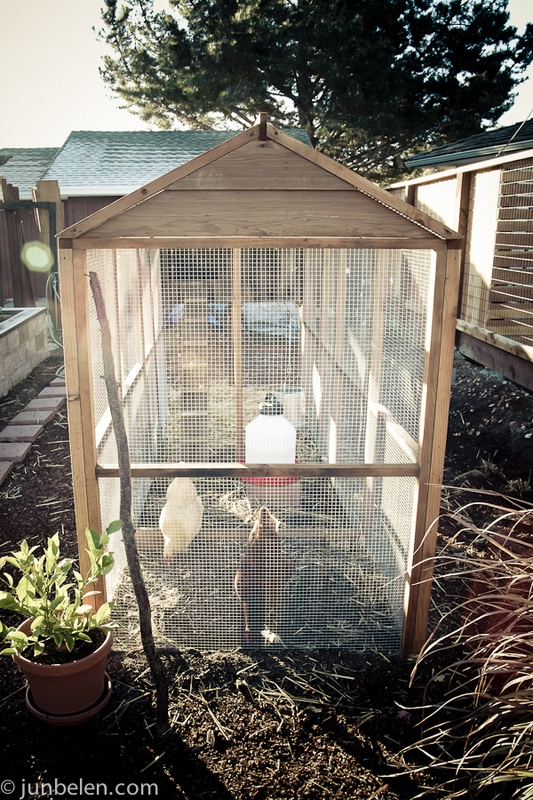 Our modest berkeley home might have room for chickens but it’s not in the works yet. You get eggs? How many? No, Chris, you can never dissuade us of anything. Thank you, as always, for your optimism. I am being sarcastic, by the way. Backyard chickens are a worthwhile pursuit. We get fresh eggs, averaging an egg a day when the hens are at their prime, then the egg count starts tapering after two years. We have learned a lot in the past two years. They did not die of “uncertain causes”. Blanche had a terrible bout with worms. I didn’t mention this in the post because I didn’t want to get into details. We almost lost Dorothy in the same way but we were able to save her because of what we learned from what happened with Blanche. For example, we learned about diatomaceous earth and how it can be used to control worms. Also, we isolated Dorothy from the other hens as soon as we saw signs that she was lethargic — the same symptoms we saw with Blanche. She bounced back after we nursed her but, alas, we lost her to a hawk! We didn’t think it will happen in an urban setting but we live in the Oakland Hills where predators abound. Who knew? This was our first crack at raising chickens and we have learned a lot. We have enjoyed it immensely. Ultimately, we would like to raise meat birds, too. And who knows, even rabbits for meat. Wow! Looks great! I haven’t used lemon grass in my cooking but I have had it in Pho and other Vietnamese dishes. Niecey, thank you so much for following the blog! Hope all is well. Please do not eat Sofia or Rose! I’m begging you!